Place pizza stone on middle oven rack. Heat oven to 450°F. Sprinkle flour on work surface. Place dough on surface; press dough with hands or roll with rolling pin to desired thickness and shape. Lightly sprinkle pizza peel with additional flour (if you do not have a pizza peel, a flat cookie sheet will work). Transfer dough to pizza peel. 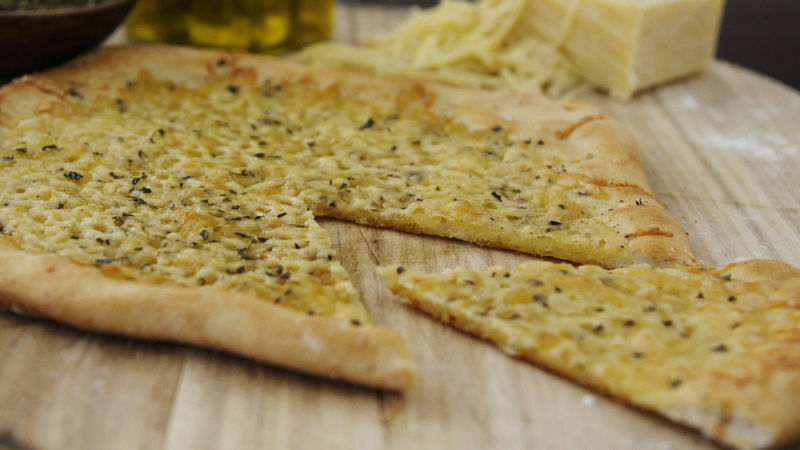 Drizzle oil over crust. Sprinkle with cheeses, oregano, salt and pepper. Transfer crust from pizza peel to pizza stone. Bake about 8 to 10 minutes or until crust is golden and cheese is bubbly. If you don’t have a pizza stone, use a rimmed cookie sheet or 15x10-inch pan with sides—invert it when you place it in the oven. For smaller pizzas, simply divide the dough into 2 portions and divide the ingredients equally between them. You can substitute any semisoft cheese for the fontina.